For some unknown reason, I decided to pick up a London Broil when I was at the store a few weeks ago, even though I had never made it before, and usually choose other cuts of beef. 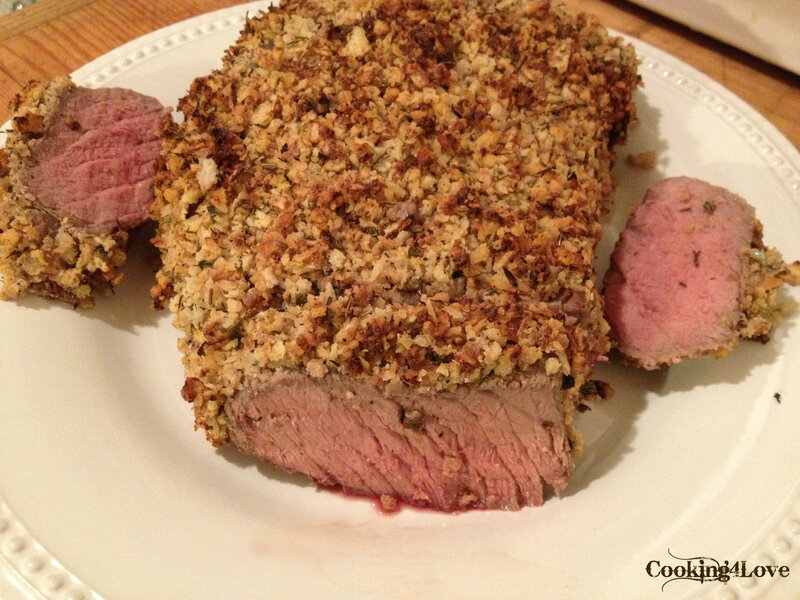 I already had the idea of using a horseradish crust, and wanted to see how it’d turn out with this type of meat. Well… it was absolutely fantastic and I loved the flavor of the crust! This can be used on your favorite type of meat, and would also be great on chicken. Sprinkle beef with 1 tbsp. salt, cover with plastic wrap, and let stand at room temperature 1 hour or refrigerate for up to 24 hours. Adjust oven rack to middle position and heat oven to 400°F. Toss panko with 2 tsp. oil, and 1/4 tsp. pepper in skillet. Cook over medium heat, stirring frequently, until deep golden brown, 3 to 5 minutes. Transfer to bowl, add crushed potato chips and toss with shallot, garlic, 2 tbsp. horseradish and herbs. Pat exterior of beef dry with paper towels and sprinkle evenly with remaining fresh cracked black pepper. Heat 1 tbsp. oil in skillet over medium-high heat until just smoking. Sear tenderloin until well browned on all sides, 5 to 7 minutes. Transfer to wire rack set in rimmed baking sheet and let rest 10 minutes. Combine 1 tbsp. horseradish, and mustard in small bowl. Spread horseradish & mustard on top and sides of meat, leaving bottom and ends bare. Roll coated sides of meat in bread-crumb mixture, pressing gently so crumbs adhere in an even layer. Return tenderloin to wire rack. Roast until instant-read thermometer inserted into center of roast registers 120 to 125°F for medium-rare, 25 to 30 minutes. Transfer roast to carving board and let rest 20 minutes. Carefully cut meat crosswise into 1/2-inch-thick slices. 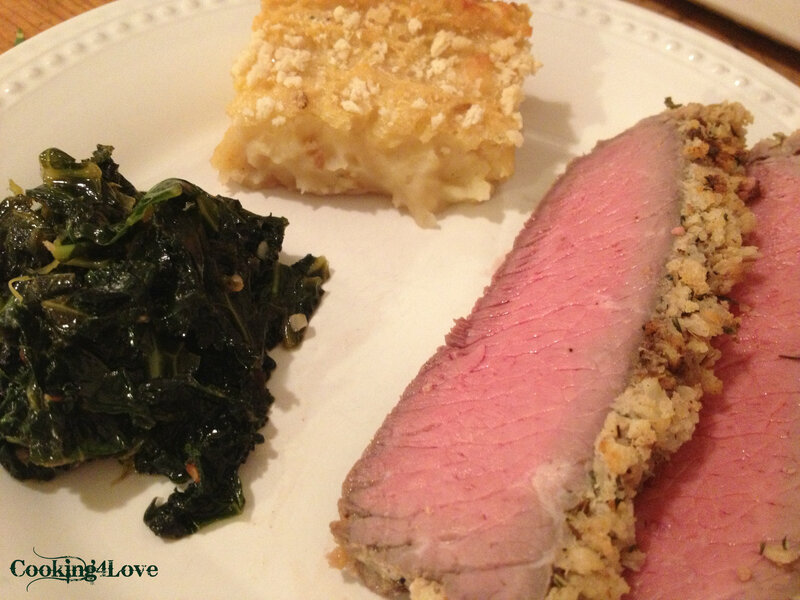 This entry was posted in Main Courses / Dinner, Meat, Recipes and tagged crusted, dinner, herbs, horseradish, London Broil, main course, meat, panko, potato chips. Bookmark the permalink.